Spring Standards Plan May 1 Double EP Release, Stream "Here We Go"
Check it out, kids, new music from the fabulous trio that is The Spring Standards is on the way and in a genius marketing maneuver, it will arrive during the season what is spring. 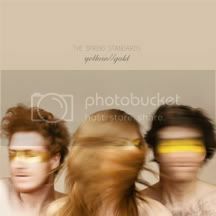 They are releasing twin EPs called yellow and gold as a single release: yellow//gold on May 1. If you're curious about what these two mini sets have in store, you can check out a song called "Here We Go." You're even encouraged to dance along, although we claim no responsibility for any uncoordinated dance injuries or YouTube embarrassment if your co-worker two cubes over catches you and posts it online. Exercise appropriate caution, people! We've got "Here We Go" right here for you to stream to your heart's content and I highly encourage you to do just that. If you're new to Spring Standards, so am I. They are a trio -- did I already mention that? -- comprised of James Cleare, Heather Robb, and James Smith and I disovered them recently when someone played "Drowning In Sobriety" on Turntable.fm. I fell madly in love with the song only to discover it exists as an iTunes exclusive, meaning I only have it in digital form (because of course I bought it). I also bought the album proper Would Things Be Different on CD along with their No One Will Know EP. Yes, I flipped for them because that's what I do. I love both collections and can't wait for this new one to arrive in May. We don't have the complete tracklisting for the record yet but we'll keep an eye out for more details as they emerge. I'm excited. Give "Here We Go" a listen and see if you catch Spring Fever!